DO NOT CONNECT POWER SUPPLY UNTIL FAN IS COMPLETELY INSTALLED. CAUTION: BEFORE CARRYING OUT ANY MAINTENANCE OR SERVICING, ENSURE THE UNIT IS DISCONNECTED FROM THE MAIN POWER SUPPLY. MATERIALS AND VAPORS OR DUST. NEVER EXPOSE THIS FAN TO TEMPERATURES EXCEEDING 140°F (60°C). 1. Do not use fan in hazardous environments where the fan electrical system could provide ignition to combustible or flammable materials. 2. Do not use fan to exhaust explosive or corrosive gases. 3. Check voltage at the fan to insure it corresponds with product nameplate. 4. Normal operation of this device may affect the supply of fresh air needed for safe operation of fuel burning equipment. Follow safety standards, codes, and heating equipment manufacturer’s procedures guide lines. 5. There are no user serviceable parts located inside the fan unit. Do NOT attempt to open (this will void manufacturer’s warranty). Return unit to the factory with original purchase receipt for service after obtaining a Return Goods Authorization (RGA). 6. All wiring must be in accordance with local and national electrical codes. When installed outside, power must be supplied from a GFCI (Ground Fault Circuit Interrupter). 7. Operate unit only in the manner intended. If you have questions, contact the manufacturer. 8. Before servicing or cleaning unit, switch power off at service panel and lock service panel to prevent power from being switched on accidentally. When the service disconnecting means cannot be locked, securely fasten a prominent warning device, such as a tag to the service panel. 9. Installation work and electrical wiring must be done by a qualified person(s) in accordance with all applicable codes and standards, including fire-rated construction. 10. This unit has an unguarded impeller. Do not use in locations where the impeller is readily accessible to people or animals. The fan can be mounted indoors or outdoors. (It is suggested that EPA recommendations be followed in choosing the fan location.) The fan may be mounted directly to the system piping or fastened to a supporting structure by means of mounting brackets provided. Mount the fan vertically with the outlet up. Insure the unit is plumb and level. When mounting directly to the system piping ensure that the fan does not contact any building surface to avoid vibration noise. Use the flexible couplers provided to secure the fan to the piping. The fan may be further secured with the mounting brackets provided. The flexible couplings will provide means of disconnect for cleaning the impeller and also to isolate vibration. The fans operate on standard 120VAC 60Hz. All wiring must be performed in accordance with the National Electrical Code and state and local building codes. A qualified electrician should perform all electrical work. Outdoor installations require the use of UL Listed watertight conduit and power supplied from a GFCI (Ground Fault Circuit Interrupter). Connect wiring with terminal block provided, observing proper connections. Condensation can form in the piping of a mitigation system when the air in the piping is chilled below its dew point. This can occur at points where the system piping goes through unheated space such as an attic, garage or outside. The system design must provide a means for water to drain back to a slab hole to remove the condensation. 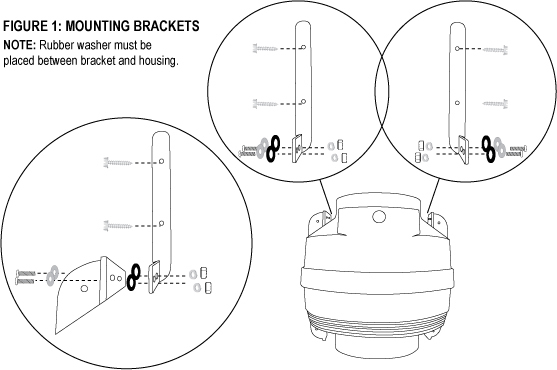 The fan MUST be mounted vertically plumb and level, with the outlet pointing up for proper drainage through the fan. Avoid mounting the fans in any orientation that will allow water to accumulate inside the fan housing. The fans are NOT suitable for underground burial. 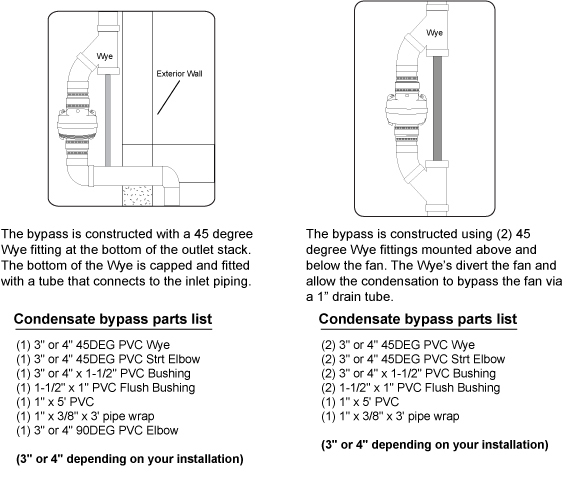 A condensate bypass should be installed in the outlet ducting as shown below. This is particularly true in cold climate installations, which require long lengths of outlet ducting or when the outlet ducting is likely to produce large amounts of condensation because of high soil moisture or outlet duct material. 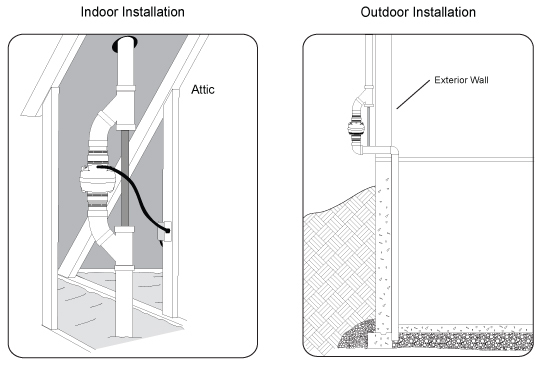 Schedule 20 piping and other thin-walled plastic ducting or aluminum downspout piping will normally produce much more condensation than Schedule 40 piping. The condensation produced in the outlet stack is collected in the Wye fitting and drained through the bypass tube. The bypass tubing may be insulated to prevent freezing. Failure to install a proper condensate collection system voids the product warranty. Install a “system on” indicator to confirm status. A pressure indicator, manometer, or vacuum alarm is recommended for this purpose. 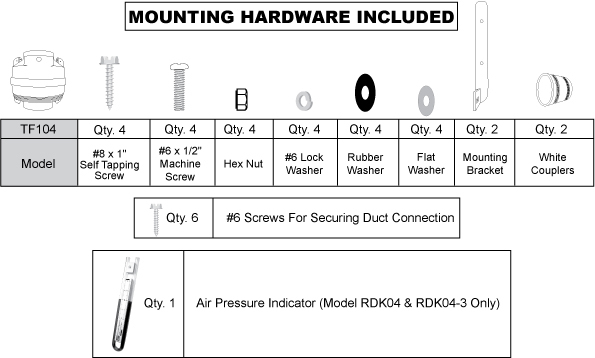 The Suncourt Air Pressure Indicator is included with models RDK04 and RDK04-3. The Suncourt® Radon Fan provides coverage up to 2000 sq. ft. per slab penetration depending on type of sub slab material. If one slab penetration does not sufficiently mitigate the Radon then additional slab penetration points can be added as required. 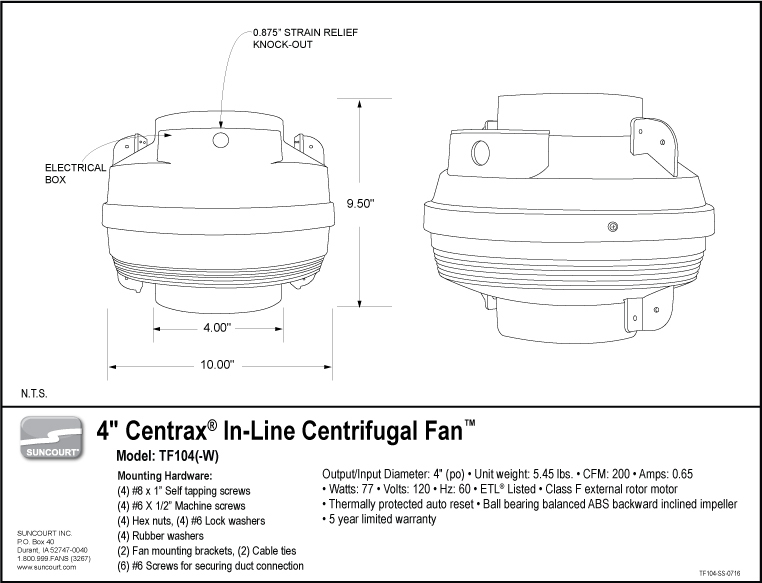 Subject to the following limitations, Suncourt® Inc. (manufacturer) warrants that the fan will, for 5 (five) years from date of original purchase, remain free from appearance of defects in workmanship or materials. This warranty is subject to the following limitations: (a) manufacturer’s liability is limited to the replacement or repair of the unit, as decided by the manufacturer; (b) a defective unit must be returned, prepaid, with proof of purchase, to Suncourt; and (c) this warranty does not apply to defects resulting from the alteration, abuse, accidental damage, unauthorized repair, or misuse of the unit. This warranty is given in lieu of all other warranties, guarantees, and conditions on manufacturer’s part, and the manufacturer shall have no tortious or other liability in respect to this fan. There is no implied warranty of merchantability and fitness for a particular purpose. Suncourt shall not be liable for any direct, indirect, special, incidental or consequential damages arising from, or relating to, the fan or the performance of it. Suncourt’s maximum liability shall not exceed the amount of the purchase price of the fan. The sole remedy under this warranty shall be the repair or replacement of the product. Call Suncourt at 1.800.999.3267 for a Return Goods Authorization (RGA) number. Please have date of original purchase available. Mark the RGA number clearly on the return shipping box. We do not accept returns without a valid RGA number. Package the unit using the original packaging including the styrofoam inserts to avoid damage in shipping. Install the Air Pressure Indicator on any clean and dry vertical section of the suction side of the vent pipe in an indoor location where the Air Pressure Indicator can be easily read. 1. Using the adhesive tape on the back, mount to the vent pipe, keeping the Air Pressure Indicator vertical so that the fluid does not run out. 2. Remove the sealing caps from the tube and allow the liquid to settle. You may need to tap the Air Pressure Indicator lightly with your finger to settle the liquid. 3. Slide the tube up-down until the liquid level is at the Zero level in both columns. Use screw provided to hold tube in place. Screw goes into the hole above the numbered section. 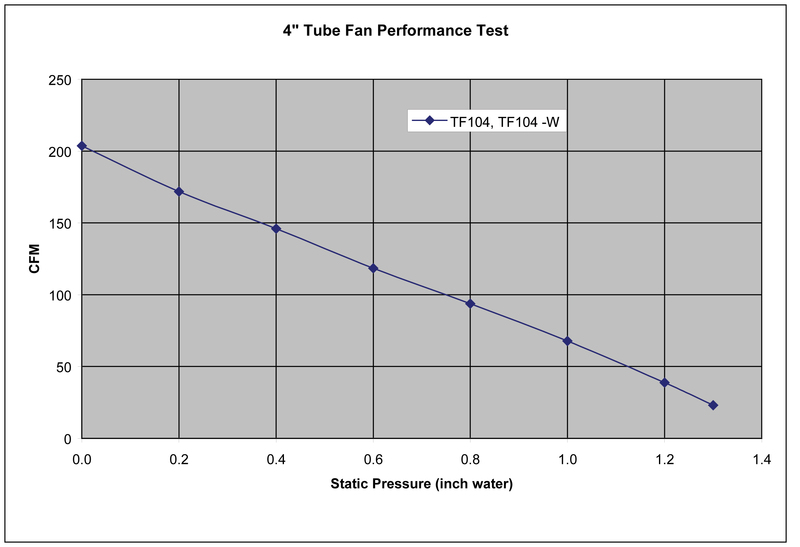 (See photo #1) This is how the indicator will look if the fan is not operating. 4. Using a 3/16” drill bit, drill a hole in the vent pipe 1” to 2” below the top of the Air Pressure Indicator. 5. Connect one end of the tubing to the top of either opening of the Air Pressure Indicator and insert the other end into the 3/16” hole. Use a little silicon sealant to make sure the hose connections are airtight. 6. 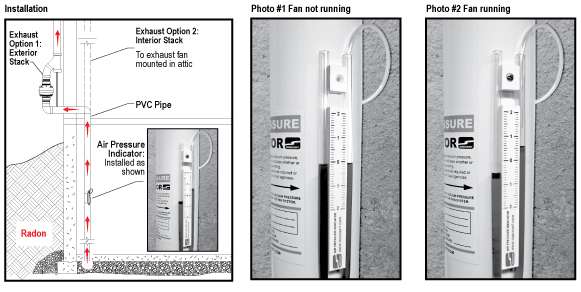 Complete the information on the installation label and apply to the vent pipe near the installation. 7. See photo #2 to see how the liquid should appear when the fan is running. The liquid will be higher on the side the 3/16” tubing was inserted into. The markings are not calibrated. You may get a different reading than what is pictured. Please Note: Do not ingest the liquid. Contact with your eyes or skin may cause irritation. Liquid will stain if spilled. 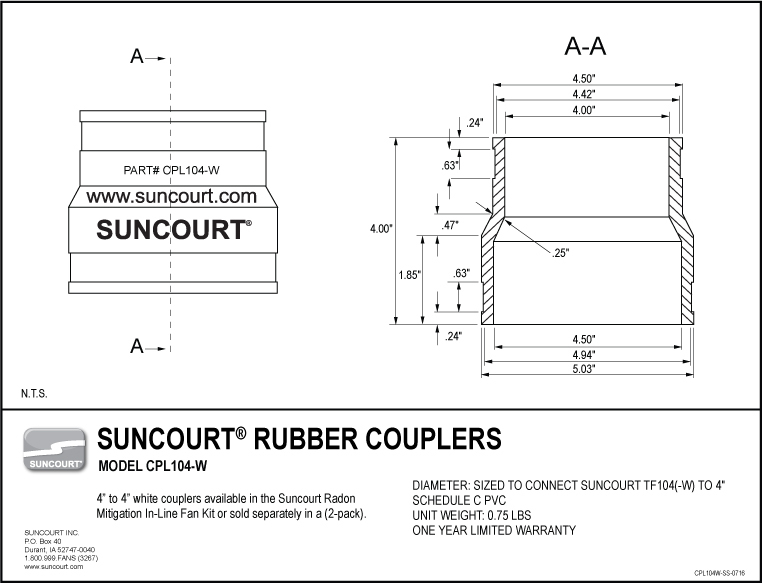 Subject to the following limitations, Suncourt® Inc. (manufacturer) warrants that the Air Pressure Indicator will, for 5 (five) years from date of original purchase, remain free from appearance of defects in workmanship or materials. This warranty is subject to the following limitations: (a) manufacturer’s liability is limited to the replacement or repair of the unit, as decided by the manufacturer; (b) a defective unit must be returned, prepaid, with proof of purchase, to Suncourt; and (c) this warranty does not apply to defects resulting from the alteration, abuse, accidental damage, unauthorized repair, or misuse of the unit. This warranty is given in lieu of all other warranties, guarantees, and conditions on manufacturer’s part, and the manufacturer shall have no tortious or other liability in respect to this Air Pressure Indicator. There is no implied warranty of merchantability and fitness for a particular purpose. Suncourt shall not be liable for any direct, indirect, special, incidental or consequential damages arising from, or relating to, the Air Pressure Indicator or the performance of it. Suncourt’s maximum liability shall not exceed the amount of the purchase price of the Air Pressure Indicator. The sole remedy under this warranty shall be the repair or replacement of the product. Ship unit to Suncourt Inc. only after obtaining a Return Goods Authorization (RGA) number. Returns without this RGA number will not be accepted. Actual product appearance may differ from illustrations. Suncourt reserves the right to modify any or all of its products’ features, designs, components and specifications without notice.